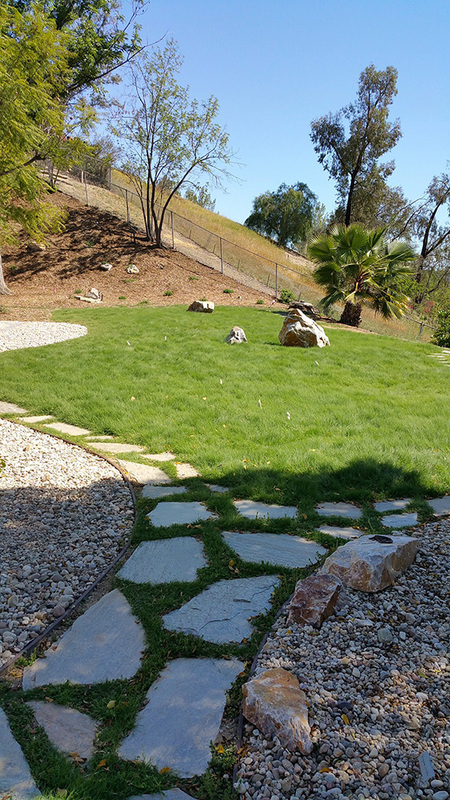 In this backyard landscape, the clients wanted to replace their Bermuda/weed mix with a span of green that would reduce heat, dust and provide a romping ground for their Australian Terrier. Our previous forays into ‘drought-tolerant’ lawns included native bent grass, sedges, rye and barley. (Las Pilitas Nursery) We found that most need the same copious water as standard non-native lawns, or are only suitable for walking on by cows. Several other meadow-style choices: Blue and side oats gramma, purple and foothill needle grass, are interesting to look at, but a bit coarse for a picnic. Rumor had it that UC Davis had produced an almost evergreen turf that needs tiny amounts of water and hardly any mowing. While installing a landscape in Ventura, we stumbled on a patch of it in in lawyer’s front yard down the street. It was beautiful! But this was Ventura. Anything can grow in Ventura. We decided to install it in Woodland Hills for a real test. The grass is UC Verde and comes from a single grower in California. For our hot valley site, the crew cleared the ground of as much Bermuda/weed mix as possible (Photo 1); installed the mail order plugs (Photo 2); after 3 weeks the stolons are happily spreading about behind the safety of their electric rabbit fence (Photo 3); and after three months the growth is almost complete. We took a chance and planted at the very end of the season, so we expected to see straggle clumps all Winter. However, the Buffalo Grass laughed and grew well into the Fall, then grew quiet but never fully dormant. In March the grass is again lush, green and ready for picnics. This grass is not native to California, but to the American Plains. If there is any native option that appears on the market, which possesses equal drought and foot traffic tolerance, we will be the first to trumpet it.